Rust bluing steel produces the highest quality, best appearing, and most durable finish known. 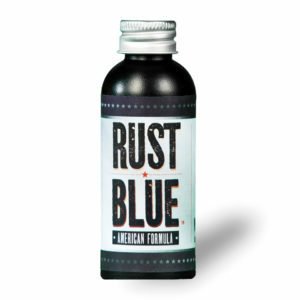 Rust blue is the authentic black iron oxide finish used by professional gun makers. Proven formulas that can accurately reproduce the correct finish on your collectible firearm. Each order is freshly weighed, mixed, and promptly shipped; resulting in the most potent product possible. That barrel brake came out beautiful! Dark and deep! Thank you! I can’t believe that old gun came out so well. I had written it off! Rust Blue was easy to apply and the directions were spot on. Thanks for a great product. That blue is the deepest color I have ever seen! It was so easy. Great product. 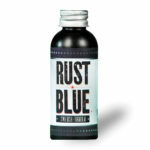 The steam pipe is the ticket for an inexpensive way to convert the rust to rust blue. It only took three passes!